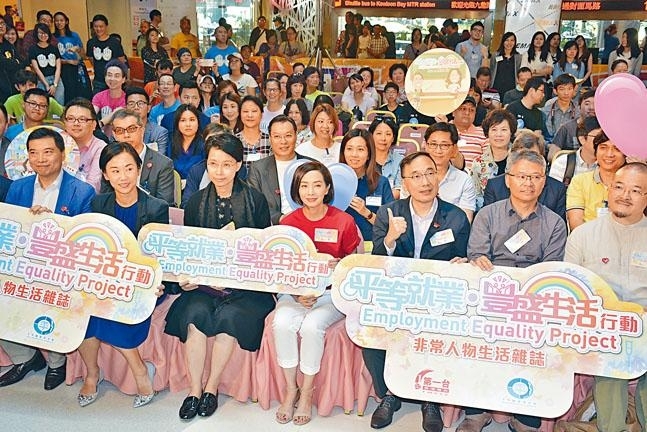 Teresa Mo Shun Kwan and Corinna Chamberlain (Chan Ming Yun) yesterday attended a Radio Hong Kong equal opportunity employment event. Mo Mo Said that as a result of starring in TOMORROW IS ANOTHER DAY (WONG GUM FA), she brought a lot of attention from the community to the autism problem and attracted many charity organizations' invitations for her to participate in charity event. She said, "Film really is very powerful, like it is speaking of many of the weak. Actually Hong Kong also has many stories of people and groups that care. If I have time I would support them, as they are very meaningful." Mo Mo said that despite winning the Hong Kong Film Award Best Actress with the film, her future film choices would not be affected. "I take roles mainly due to the script. I really like comedy too, making people laugh isn't easy. If it's realistic and able to make society think then it's even better. I am a little greedy in this aspect." She revealed that lately she received some scripts, she would consider productions in Hong Kong first. She said, "I am busy with a food related project." Would she open a restaurant? She said, "Probably, but it won't be a supper club. I will make the announcement in June or July."